Take it from a local: September is one of the best months to be in Ocean City. The air temperature is ideal, the water temperature is close to its highest point, and all of the shops, attractions, and restaurants are still open. That being said, often times Marylanders find that they can’t enjoy Ocean City in September because their kids have to go back to school in late August. Is this fair? No. Do you want that to change? Of course you do. Is there a way to change it? There most certainly is! Recently there has been a movement called “Marylanders for Longer Summers” which hopes to change the date that kids have to go back to school. The ultimate goal is to have kids start school after Labor Day; a holiday which usually grants parents the day off, thus allowing for more time at the beach. This extra time at the beach could be used to create more memories with your family, enjoy a few more days under the sun, and give you more time to relax before heading back into the hectic school year. The main opposition to the proposal is the thought that school wouldn’t be able to be completed until late June/early July if we adopted a post-Labor Day starting date. Well, for the 2014-2015 school year, Worcester County started school after Labor Day and were able to complete their school year on June 17th. This was done without compromising any of the standard holiday closures, and only required a little planning and common sense to achieve. There seems to be no credible reason not to support a post-Labor Day starting date, something that 72% of Marylanders agree with. The best part is, if you agree with this initiative, you can go here and let your local leaders know that you support a post-Labor Day starting date for schools. So, if you want a little extra time at the beach, some bonus fun under the sun, and chances to create more memories with your loved ones, let your local leaders know! Take it from a local: September is one of the best months to be in Ocean City. The air temperature is ideal, the water temperature is close to its highest point, and all of the shops, attractions, and restaurants are still open. That being said, often times Marylanders find that they can’t enjoy Ocean City in September because their kids have to go back to school in late August. Is there fair? No. Do you want that to change? Of course you do. Is there a way to change it? There most certainly is! Recently there has been a movement called “Marylanders for Longer Summers” which hopes to change the date that kids have to go back to school. The ultimate goal is the have kids start school after Labor Day; a holiday which usually grants parents the day of thus allowing for more time at the beach. This extra time at the beach could be used to create more memories with your family, enjoy a few more days under the sun, and give you more time to relax before heading back into the hectic school year. The main opposition to the proposal is the thought that school would wouldn’t be able to be completed until late June/early July if we adopted a post-Labor Day starting date. Well, for the 2014-2015 school year, Worcester County started school after Labor Day and were able to complete their school year on June 17th. This was done without compromising any of the standard holiday closures, and only required a little planning and common sense to achieve. There seems to be no credible reason not to support a post-Labor Day starting date, something that 72% of Marylanders agree with. 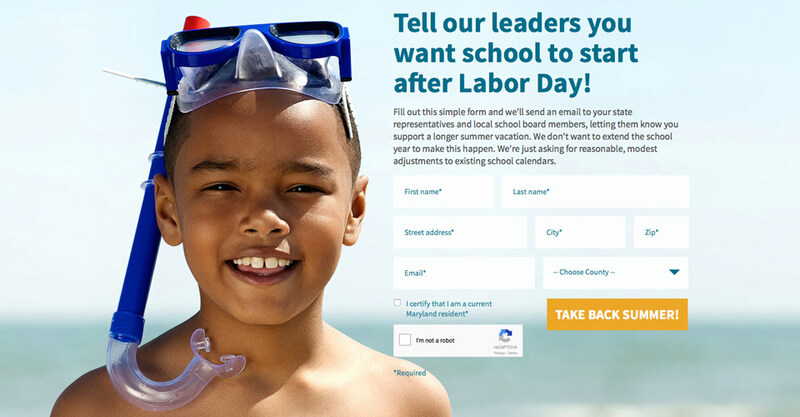 The best part is, if you agree with this initiative, you can go hereand let your local leaders know that you support a post-Labor Day starting date for schools. So, if you want a little extra time at the beach, some bonus fun under the sun, and chances to create more memories with your loved ones, let your local leaders know!